INTRODUCTION: Hematopoietic stem cell transplantation (HSCT) is a curative treatment for children with serious hematological disorders including thalassemia major (TM) and sickle cell disease (SCD). This study aimed to determine the frequencies of transplant-related morbidity and outcome in our tertiary health-care facility. MATERIALS AND METHODS: We retrospectively analyzed the clinical, laboratory, and outcome data of 32 cases of hemoglobinopathies (TM = 19 and SCD = 13) who underwent bone marrow (BM) transplantation between 2005 and 2016. 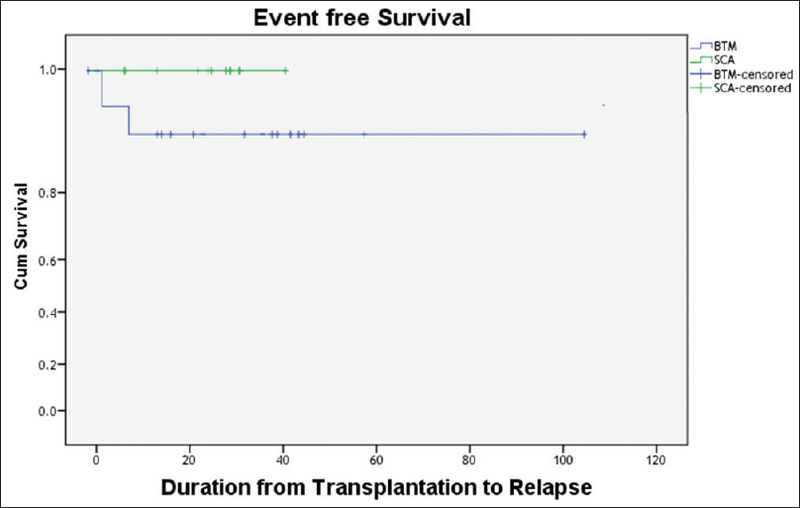 SPSS was used for statistical analysis, and Kaplan–Meier curve was constructed for overall survival (OS) and event-free survival. RESULTS: The median age of the study population at the time of transplant was 7.8 (range 2–14 years). Male-to-female ratio was 1:1. All patients were received allogeneic full matched related donor transplantation. Conditioning regimen was Bu/Cy/antithymocyte globulin (ATG) for SCD and Flu/Bu/Cy/ATG for TM. Source of stem cell in all patients was bone marrow and median stem cell dose CD 34+ was 5.26 (range 2.9–9.9) × 106/kg. All patients were received cyclosporin and methotrexate for graft versus host disease (GVHD) prophylaxis. Acute and chronic GVHD were observed in 10 (31.25%) and 2 (6.3%) cases, respectively. The median time to absolute neutrophil count (ANC) engraftment was 22 days (range: 12–27), and the median time to platelet engraftment was 32 days (range: 18–45) in 28 patients and the remaining four patients had delayed platelet engraftment (62–90 days). Cytomegalovirus (CMV) reactivation was observed in 18 (56.3%) cases; majority were asymptomatic (n = 17/18; 94.4%). Three-year event-free survival (EFS) and OS were 90.6% and 93.7%, respectively, with median duration of follow-up 33.72 (± 25.3) months. CONCLUSION: The results of the pediatric HSCT for hemoglobinopathies at our institution are excellent and are comparable to published reports from international collaborative groups. Since the first successful transplant performed in a child with TM by Thomas et al. in Seattle, more than 1000 patients with TM or SCD have been cured by HSCT, in most cases performed using a human leukocyte antigen (HLA)-identical sibling donor with bone marrow (BM) as the stem cell source. More recently, BM transplantation (BMT) from an unrelated volunteer, selected by high-resolution molecular typing of Class I and II HLA loci and stringent criteria of compatibility, also proved to be a possible alternative for selected patients with TM who lack a compatible family donor., In the last two decades, cord blood from an HLA-identical sibling increasingly is being used as an alternative source of hematopoietic cells for transplanting patients. All of these advances have resulted in both improved outcomes and greater use of HSCT in clinical practice. Specific studies regarding BMT indications in children with hemoglobinopathies, their complications, outcome, and survival are deficient from this region, and the majority of data are derived from studies performed on adults or in combination and only few local data have been available especially from this region. Thus, we are planning to conduct this study to determine the frequencies of transplant-related morbidity and mortality and to report the prognosis and outcome of these pediatric post-HSCT cases at in our BMT unit. This study is a retrospective analysis of clinical and laboratory data of post-HSCT pediatric patients. We included all pediatric patients with hemoglobinopathies consecutively underwent HSCT at pediatric BMT unit, King Faisal Specialist Hospital and Research Centre (KFSH and RC)-Jeddah, Saudi Arabia, over a period of 10 years from 2005 to 2016. KFSH and RC-Jeddah is a tertiary health-care facility and is accredited by the international arm of the Joint Commission International Accreditation Survey. There is a 20-bed, pediatric hematology/oncology ward along with a 5-bed HSCT unit within the hematology/oncology ward. A total of 110 pediatric patients underwent HSCT in the last 10-year duration and average HSCT was 11 per year, of them 1/4 were patients with a diagnosis of hemoglobinopathies. All cases under 14 years of age with a diagnosis of hemoglobinopathies, who were admitted to the pediatric HSCT unit for transplantation from 2005 to 2016, were included in this study, including two patents who received second transplantation due to engraftment failure. For the definition of GVHD, veno-occlusive disease (VOD), CMV reactivation, viremia/infection, and engraftment failure, the Center of International Blood and Bone Marrow Transplantation Research manual definitions forms 2450 Manual and the American Society for Blood and Marrow Transplantation (2009) guidelines were accepted. All cases with a diagnosis of hemoglobinopathies, who received BMT, and who were under 14 years of age were identified by internal BMT registry and were included in the analysis. For those patients who had more than one BMT, each BMT was counted and analyzed as separate case. The basic demographic feature was collected for both recipients and donors. Primary diagnosis, indication of HSCT, and co-morbidities were also noted. Data about type of different BMT procedures, conditioning regimen, and GVHD prophylaxis were also collected. Pretransplant CMV status of all recipients and donors along with post-HSCT assessment, investigations, and prophylaxis and management of CMV was also recorded. The overall survival (OS) was defined as the time interval between the date of transplantation and the date of death or the date of last follow-up visit. The EFS was taken as the period between the date of transplantation and the date of relapse, engraftment failure, or date of death from any cause. All the clinical data were analyzed retrospectively using SPSS package software version 20.0 (IBM, Chicago, IL, USA). Summary statistics was used to describe the cohort. The frequency of CMV antigenemia was measured during the posttransplantation period of 100 days. Frequencies were computed for qualitative variables, and the mean and standard deviation was computed for quantitative variables. Kaplan–Meier curve was constructed for OS and EFS. The study was started after approval from the Institutional Review Board of KFSH and RC-Jeddah. The total number of transplantation in hemoglobinopathy patients during this study period was 32, and two TM patients received second transplantation due to engraftment failure. Of 32 transplantation cases, 19 (59.4%) were TM and the remaining 13 (40.6%) were SCD patients [Table 1]. The median age of the study population at the time of transplant was 7.8 (range 2–14 years). Male-to-female ratio was 1:1. All patients were received allogeneic full matched related donor transplantation, out of 32 donors 14 each were brother and sister, 3 were mother and 1 was father. 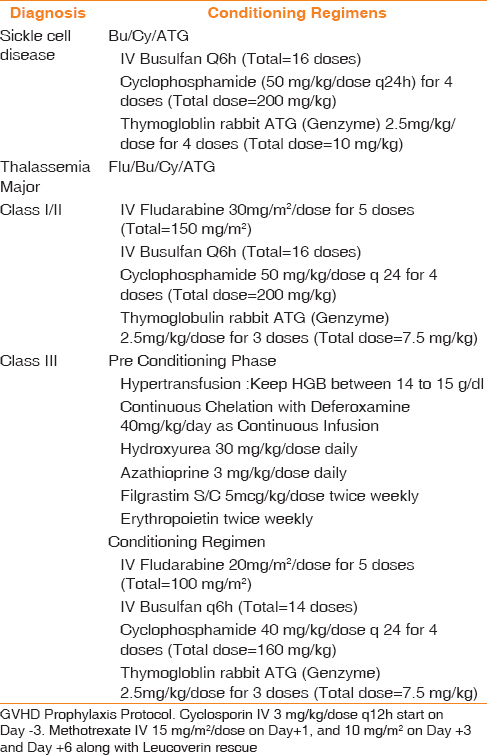 Conditioning regimen for SCA was busulfan, cyclophosphamide, and thymoglobulin rabbit antithymocyte globulin (ATG) (Bu/Cy/ATG) and for TM was fludarabine, busulfan, cyclophosphamide, and thymoglobulin rabbit ATG (Flu/Bu/Cy/ATG) [Table 2]. The source of stem cell in all patients was BM. The median stem cell dose CD 34+ was 5.26 (range, 2.9–9.9) × 106/kg. All patients received cyclosporine and methotrexate for GVHD prophylaxis. Acute GVHD was observed in 10 (31.25%) cases, of them skin was involved in 5 (15.6%), gut (n = 2, 6.3%), liver (n = 2, 6.3%), and both skin and gut (n = 1, 3.1%). Grades I, II, III, and IV GVHD were observed in 1 (3.1%), 4 (12.5%), 4 (12.5%), and 1 (3.1%) patient, respectively. Chronic GVHD was noticed in 2 (6.3%) patients and both had skin Grade I–II GVHD. The median time to ANC engraftment was 22 (range: 12–27) days in most patients except two. One patient had delayed ANC engraftment at day 57 secondary to infection, and another patient was expired before day 28 posttransplantation. The median time to platelet engraftment was 28 (range: 18–90) days, of them four patients had delayed platelet engraftment (62–90 days). CMV reactivation was observed in 18 (56.3%) cases within 100 days of post-BMT. Of them, majority were asymptomatic (n = 17; 53.1%). Only one patient (n = 1; 3.2%) had clinical CMV infection and manifestation of organ involvement (pneumonia and skin manifestation) and was expired on day + 75 posttransplantation due to acute respiratory distress syndrome. Most of CMV cases were resolved (n = 17; 53.1%). In most cases (16/18; 88.8%), the level of antigenemia declined within 2 weeks as a result of the continuation of GCV therapy. Three-year EFS and OS were 90.6% and 93.7%, respectively, with median duration of follow-up of 33.72 (±25.3) months [Figure 1] and [Figure 2]. In subgroup analysis, SCA patients had EFS and OS of 100%; however, TM patients had EFS and OS of 83.3% and 88.9%, respectively. Two beta-TM patients lost engraftment at 6-month and 9-month posttransplantation, both belonged to Class III thalassemia and received second transplantation. Thalassemia-free survival was 88.9%. Both patients who expired had a diagnosis of TM, one expired at day +16 posttransplantation with pulmonary hemorrhage and massive ICH and another had CMV infection and was expired at day + 75 posttransplantation with ARDS. The outcome of transplantation is dependent on multiple clinical factors and development of GVHD, CMV infection and engraftment are few of those important factors responsible for success. The following observations were made in relation to these specific conditions and complications in our study. Acute GVHD is one of the major complications of BMT. In our study, acute GVHD was observed in 10 (31%) cases, overall rate of GVHD was 19.8%, and as high as 28.3% was observed in allogeneic transplant patients, which is substantially lower than reports recently published by other centers. However, another center of our region reported the GVHD rate of 35%, which was similar to what has been described in several international studies., Many variables can impact the likelihood and severity of GVHD; however, the most important factor reported is HLA disparity. A meta-analysis suggested that acute GVHD is slightly increased and chronic GVHD is increased when comparing PBSC and BM transplants. Notably, 31.6% (12/38) of patients developed rising antigenemia in our study had acute GVHD and 12/26 (46.2%) patients with acute GVHD had a history of CMV reactivation, suggesting significant associations between two and that the immunological status of the host may be of importance. Despite recent outstanding progresses in preventing transplantation complications, the occurrence and fatality rates of GVHD and engraftment failure after allo-HSCT remain high and may be limiting factors in the clinical application of allo-HSCT.,, Stable engraftment of donor hematopoiesis in which donor cells are integrated into the recipient's cell population is essential for a successful outcome of BMT., Reduced donor chimerism is closely related to graft rejection and primary disease reoccurrence and should, therefore, be measured dynamically after transplantation. The frequency and timing of engraftment in our study is comparable with other published data. Previous reports have shown incidences of engraftment failure after allo-HSCT of 5%–27%, suggesting that it represents a severe posttransplant complication. Patients who experienced engraftment failure showed continuous bilineage or trilineage dysplasia for at least 30 days., Previous reports have focused on two factors: first repopulation problems caused by inadequate infusion of hematopoietic stem cells or conditioning-induced hematopoietic stromal cell damage, BM fibrosis or BM suppression during transplantation. Secondly posttransplatation GVHD, VOD and virus infection, which may destroy blood cells and cause engraftment failure. Unfortunately, the clinical group studied is small in number, homogeneous, single center, and retrospective; therefore, the results should be generalized with caution. The results of the pediatric HSCT for thalassemia and sickle cell anemia at our institution are excellent and are comparable to published reports from international collaborative groups. However, the duration of follow-up is short, and the long-term outcome is yet to be determined. The authors thank all transplantation team of the KFSH and RC–Jeddah, especially our BM coordinators Ms. Bayanah and clinical pharmacist Dr. Marwa for their contributions, and all the patients. Borgna-Pignatti C, Rugolotto S, De Stefano P, Zhao H, Cappellini MD, Del Vecchio GC, et al. Survival and complications in patients with thalassemia major treated with transfusion and deferoxamine. Haematologica 2004;89:1187-93. Rees DC, Williams TN, Gladwin MT. Sickle-cell disease. Lancet 2010;376:2018-31. Panepinto JA, Walters MC, Carreras J, Marsh J, Bredeson CN, Gale RP, et al. Matched-related donor transplantation for sickle cell disease: Report from the center for international blood and transplant research. Br J Haematol 2007;137:479-85. Bernaudin F, Socie G, Kuentz M, Chevret S, Duval M, Bertrand Y, et al. Long-term results of related myeloablative stem-cell transplantation to cure sickle cell disease. Blood 2007;110:2749-56. Bernardo ME, Piras E, Vacca A, Giorgiani G, Zecca M, Bertaina A, et al. Allogeneic hematopoietic stem cell transplantation in thalassemia major: Results of a reduced-toxicity conditioning regimen based on the use of treosulfan. Blood 2012;120:473-6. Fleischhauer K, Locatelli F, Zecca M, Orofino MG, Giardini C, De Stefano P, et al. Graft rejection after unrelated donor hematopoietic stem cell transplantation for thalassemia is associated with nonpermissive HLA-DPB1 disparity in host-versus-graft direction. Blood 2006;107:2984-92. Herr AL, Kabbara N, Bonfim CM, Teira P, Locatelli F, Tiedemann K, et al. Long-term follow-up and factors influencing outcomes after related HLA-identical cord blood transplantation for patients with malignancies: An analysis on behalf of eurocord-EBMT. Blood 2010;116:1849-56. Henig I, Zuckerman T. Hematopoietic stem cell transplantation–50 years of evolution and future perspectives. Rambam Maimonides Med J 2014;5:e0028. El Solh H, Al-Nasser A, Al-Sudairy R. Bone marrow transplantation in children: The King Faisal specialist hospital experience. Saudi J Kidney Dis Transpl 1996;7:194-8. Available from: http://www.cibmtr.org/DataManagement/TrainingReference/Manuals/DataManagement/Documents/post-ted-instruction.pdf. [Last accessed on 2018 Nov 14]. Tomblyn M, Chiller T, Einsele H, Gress R, Sepkowitz K, Storek J, et al. Guidelines for preventing infectious complications among hematopoietic cell transplantation recipients: A global perspective. Biol Blood Marrow Transplant 2009;15:1143-238. Angelucci E, Matthes-Martin S, Baronciani D, Bernaudin F, Bonanomi S, Cappellini MD, et al. Hematopoietic stem cell transplantation in thalassemia major and sickle cell disease: Indications and management recommendations from an international expert panel. Haematologica 2014;99:811-20. Baronciani D, Pilo F, Lyon-Caen S, Poetschger U, Dini G, Peters C. Hematopoietic Stem Cell Transplantation in Thalassemia Major. Report from the EBMT Hemoglobinopathy Registry. ASH Annual Meeting 2011. Blood 2011; 118:905. Majumdar S, Robertson Z, Robinson A, Starnes S, Iyer R, Megason G. Outcome of hematopoietic cell transplantation in children with sickle cell disease, a single center's experience. Bone Marrow Transplant 2010;45:895-900. McPherson ME, Hutcherson D, Olson E, Haight AE, Horan J, Chiang KY, et al. Safety and efficacy of targeted busulfan therapy in children undergoing myeloablative matched sibling donor BMT for sickle cell disease. Bone Marrow Transplant 2011;46:27-33. Bernaudin F, Robin M, Ferry C, Yacouben K, Dalle JH, Peffault de Latour R, et al. Related myeloablative stem cell transplantation (SCT) to cure sickle cell anemia (SCA): Update of French results. Blood 2010;116:3518. Hsieh MM, Kang EM, Fitzhugh CD, Link MB, Bolan CD, Kurlander R, et al. Allogeneic hematopoietic stem-cell transplantation for sickle cell disease. N Engl J Med 2009;361:2309-17. Horwitz ME, Spasojevic I, Morris A, Telen M, Essell J, Gasparetto C, et al. Fludarabine-based nonmyeloablative stem cell transplantation for sickle cell disease with and without renal failure: Clinical outcome and pharmacokinetics. Biol Blood Marrow Transplant 2007;13:1422-6. Fries BC, Riddell SR, Kim HW, Corey L, Dahlgren C, Woolfrey A, et al. Cytomegalovirus disease before hematopoietic cell transplantation as a risk for complications after transplantation. Biol Blood Marrow Transplant 2005;11:136-48. Jacobsohn DA. Acute graft-versus-host disease in children. Bone Marrow Transplant 2008;41:215-21. Ferrara JL, Deeg HJ. Graft-versus-host disease. N Engl J Med 1991;324:667-74. Sullivan KM, Weiden PL, Storb R, Witherspoon RP, Fefer A, Fisher L, et al. Influence of acute and chronic graft-versus-host disease on relapse and survival after bone marrow transplantation from HLA-identical siblings as treatment of acute and chronic leukemia. Blood 1989;73:1720-8. Cutler C, Giri S, Jeyapalan S, Paniagua D, Viswanathan A, Antin JH, et al. Acute and chronic graft-versus-host disease after allogeneic peripheral-blood stem-cell and bone marrow transplantation: A meta-analysis. J Clin Oncol 2001;19:3685-91. Nichols WG, Corey L, Gooley T, Drew WL, Miner R, Huang M, et al. Rising pp65 antigenemia during preemptive anticytomegalovirus therapy after allogeneic hematopoietic stem cell transplantation: Risk factors, correlation with DNA load, and outcomes. Blood 2001;97:867-74. Yanada M, Yamamoto K, Emi N, Naoe T, Suzuki R, Taji H, et al. Cytomegalovirus antigenemia and outcome of patients treated with pre-emptive ganciclovir: Retrospective analysis of 241 consecutive patients undergoing allogeneic hematopoietic stem cell transplantation. Bone Marrow Transplant 2003;32:801-7. Ljungman P, Griffiths P, Paya C. Definitions of cytomegalovirus infection and disease in transplant recipients. Clin Infect Dis 2002;34:1094-7. Takatsuka H, Wakae T, Mori A, Okada M, Fujimori Y, Takemoto Y, et al. Endothelial damage caused by cytomegalovirus and human herpesvirus-6. Bone Marrow Transplant 2003;31:475-9. Meyers JD, Flournoy N, Thomas ED. Risk factors for cytomegalovirus infection after human marrow transplantation. J Infect Dis 1986;153:478-88. Osarogiagbon RU, Defor TE, Weisdorf MA, Erice A, Weisdorf DJ. 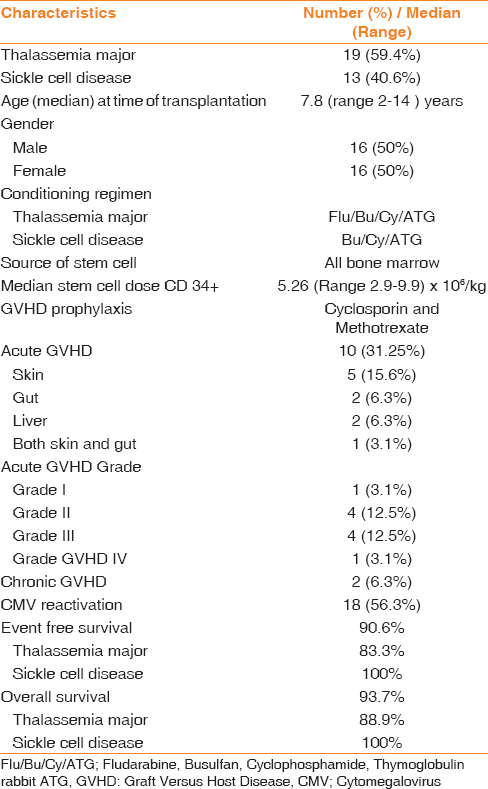 CMV antigenemia following bone marrow transplantation: Risk factors and outcomes. Biol Blood Marrow Transplant 2000;6:280-8. Machado CM, Menezes RX, Macedo MC, Mendes AV, Boas LS, Castelli JB, et al. Extended antigenemia surveillance and late cytomegalovirus infection after allogeneic BMT. Bone Marrow Transplant 2001;28:1053-9. Matthes-Martin S, Aberle SW, Peters C, Holter W, Popow-Kraupp T, Pötschger U, et al. CMV-viraemia during allogenic bone marrow transplantation in paediatric patients: Association with survival and graft-versus-host disease. Bone Marrow Transplant 1998;21 Suppl 2:S53-6. Einsele H, Hebart H, Kauffmann-Schneider C, Sinzger C, Jahn G, Bader P, et al. Risk factors for treatment failures in patients receiving PCR-based preemptive therapy for CMV infection. Bone Marrow Transplant 2000;25:757-63. Nguyen Q, Champlin R, Giralt S, Rolston K, Raad I, Jacobson K, et al. Late cytomegalovirus pneumonia in adult allogeneic blood and marrow transplant recipients. Clin Infect Dis 1999;28:618-23. Deeg HJ, Antin JH. The clinical spectrum of acute graft-versus-host disease. Semin Hematol 2006;43:24-31. Bittencourt H, Rocha V, Filion A, Ionescu I, Herr AL, Garnier F, et al. Granulocyte colony-stimulating factor for poor graft function after allogeneic stem cell transplantation: 3 days of G-CSF identifies long-term responders. Bone Marrow Transplant 2005;36:431-5. Davies SM, Kollman C, Anasetti C, Antin JH, Gajewski J, Casper JT, et al. 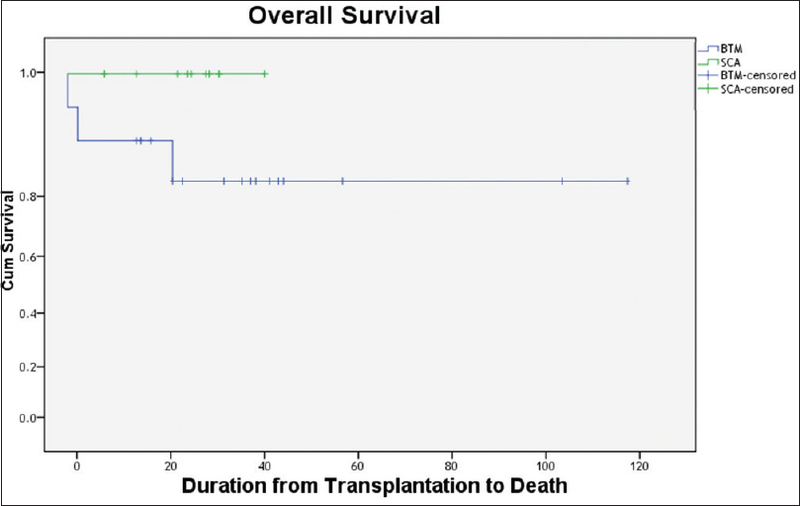 Engraftment and survival after unrelated-donor bone marrow transplantation: A report from the national marrow donor program. Blood 2000;96:4096-102. O'Donnell PV. Hematopoietic Stem Cell Transplantation: A Handbook for Clinicians. Bethesda, Maryland: AABB; 2009. p. 163-78. Xiao Y, Song J, Jiang Z, Li Y, Gao Y, Xu W, et al. Risk-factor analysis of poor graft function after allogeneic hematopoietic stem cell transplantation. Int J Med Sci 2014;11:652-7. Larocca A, Piaggio G, Podestà M, Pitto A, Bruno B, Di Grazia C, et al. Boost of CD34+-selected peripheral blood cells without further conditioning in patients with poor graft function following allogeneic stem cell transplantation. Haematologica 2006;91:935-40. Dominietto A, Raiola AM, van Lint MT, Lamparelli T, Gualandi F, Berisso G, et al. Factors influencing haematological recovery after allogeneic haemopoietic stem cell transplants: Graft-versus-host disease, donor type, cytomegalovirus infections and cell dose. Br J Haematol 2001;112:219-27.